Don’t overlook family members, friends and co-workers big day. The big day that you shouldn’t be missing is their Birthday! Even if people don’t solicit the date of their birthday, it doesn’t mean that you should ignore the fact they still love to receive birthday wishes. Letting someone know to have a happy birthday shows that you really take the time to care about them. Most people waltz around life only thinking of themselves. How great would you be to remember your peer’s birthdays? It’s selfless and will warm anyone’s heart that you remembered how important they are by wishing a happy birthday. Most of us have experienced the doom and gloom of a birthday. Everyone has a least favorite birthday they can remember and for some, they bury this feeling. You can reverse this, and make everyone you know feel valued and loved by wishing them and outstanding happy birthday. 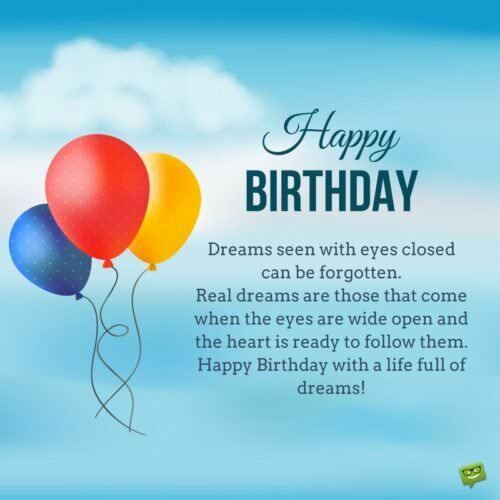 You don’t have to go far out of the way and enlighten them with a mesmerizing gift; a simple happy birthday wish will go farther than any gift you can buy. People just want to feel like they are part of something, and if that is their birthday then make the birthday wish count! Print a birthday message with a photo on a T-shirt, mouse pad, pillowcase or other blank surface. You likely have a local place that offers this service, or you can buy printable supplies and do it yourself. Or you could check online stores! Google “online T-shirt printing” or anything similar, and find online-stores that print on various surfaces. It wouldn’t be a bad idea to read some reviews before you contact the shop. Say it in an ad in a local paper that your loved one reads. Write a birthday message with ‘glow in the dark’ pens or paints on a pillowcase or somewhere (ceiling) your loved one will see it. Little kids will love reading these glowing words. You could write: Happy Birthday, You light up our life! Tape a happy birthday note to the bottom of a clear glass. Fill it with a favorite beverage for a loved one to find and read later. Write birthday messages on balloons with permanent markers, or simply decorate some balloons with our Heartwarming Expressions Stickers and create a birthday bouquet. Make a keepsake bookmark, listing the date and their age, along with your birthday wishes. Tuck it inside a new book by their favorite author. Share an impressive video on Facebook from our very own page. You’ll find any style of a message on an image, too! Buy a journal and record a birthday message with a special memory of the birthday person. A child would love a story about the day they were born. Buy a scrapbook album and include a promise to make a scrapbook layout of the birthday. Bring your camera and take fun birthday photos. Go extravagant. Put it on a local billboard, on the side of a sky blimp, or written by a sky writer to read while having a picnic. Happy Birthday to my dearest friend! Go simple. Write happy birthday on a beach in the sand with a stick, or spell it out in small shells or rocks. Do a documentary on the life of someone you love honoring them. You can have old videos, favorite photographs and even scrapbook pages edited and put on a video. You can gather a group of people to sing Happy Birthday and record their own personal birthday wishes and messages. This can be especially thoughtful if you are miles away from someone you love during their birthday. The sight and sound of loved ones is irreplaceable. Decorate the video cassette box with birthday stickers and photocopies of favorite photographs. Write a birthday message on a driveway or sidewalk using chalks. Say it on a post-it-note. 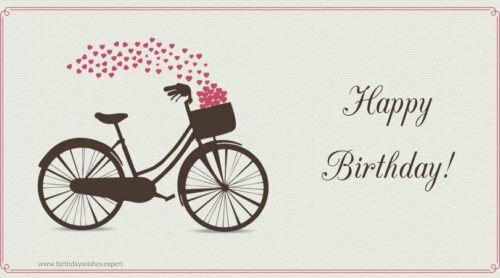 Send birthday wishes by e-mail or fax. Go traditional and buy an affordable but lovely present – as one does! Here is our collection of articles with the most amazing birthday gift ideas. 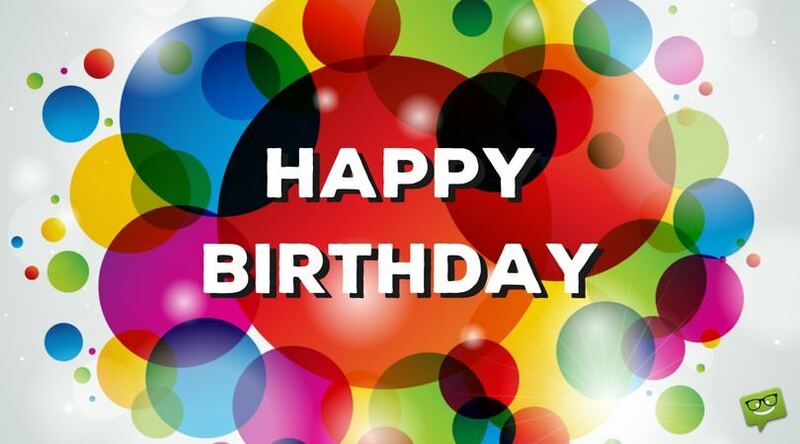 Send one of our selected original birthday videos on YouTube. Write it with icing on a cake or a big cookie. Put it on a note inside someone’s lunch or in their pocket. Write it on a steamed up bathroom mirror using your finger. On a frosty window using your fingernail. Record it on an answering machine. Sneak birthday wishes inside a fortune cookie. Call your local radio station with a special birthday song dedication. Tape your birthday message on a music CD with an invitation to dinner. Leave it in a car dashboard as a surprise. Send a heartfelt letter by snail mail with a handmade or bought gift certificate. Create an enormous jumbo sized birthday card. Add photos, funny keepsakes and jazz it up with our Birthday, Girls Rule, Boy Stuff, or Over the Hill Stickers! Say it on a Starbucks Memory Tumbler. Keep Calm and… Happy Birthday!